There is a trend among caravanners for downsizing as they seek to reduce the cost of touring, by opting for smaller, more economical tow cars. This in turn means smaller caravans are becoming more appealing. There are a few options from mainstream manufacturers but if you want something genuinely compact, you have to think outside the box. Literally. The Going Cockpit does just that. The Cockpit is not an entirely new model. It first appeared in 2006. The tiny GRP one-piece bodyshell mounted on a lightweight chassis looked distinctive and was imported to the UK in small numbers. Built by the now defunct Portuguese Pluma Caravans, manufacture of the micro-tourer ceased, but limited production has restarted and new models are exclusively available again, through the Red Lion Caravan Centre in Ormskirk. The Going uses Al-Ko running gear but also features a T drawbar. This means that the axle is set quite far back to balance the Cockpit up. The well-finished GRP bodyshell is narrower at the nose and widens gradually towards the rear. The wheel arches protrude from the sidewalls, minimising wheel box intrusion and so increasing storage space inside. Front side lights are neatly moulded into the wheel spats. The configuration of the short chassis with the wheels set far back makes the Cockpit very easy to tow. A hitch stabiliser is not fitted but the van’s light weight means it is not required. The Cockpit has wheel trims fitted as standard, but alloy wheels are an optional extra. As it stands, the van is basic, but like modern vans, it has a 230V inlet socket. The one-piece front window is sealed shut, but there’s one on each side and these do open. Entry to the van is via a one-piece rear door which has an oval porthole. If you are tall and require additional headroom, the Cockpit has an easy-to-lift pop top, fitted with vent flaps. Two rear corner steadies are fitted with two grabhandles at the front. The lounge is very compact, but it’s surprisingly roomy all the same. For two it is quite snug, but for a single caravanner there would be plenty of room. The dinette has wrap-around seating and comes with a swivel table mounted on a single leg that clips to the floor. Over the front window there’s a small shelf and on the seat base on the offside is a mains socket. For the size of the Cockpit, it is rather comfortable and feels cosy to be in, especially on a wet day. You will find there is just one strip lamp here but twin LED corner spotlights could be fitted to brighten up the lounge. The side kitchen is fitted with the essentials, including a twin-burner gas hob finished in stainless steel, but there is no grill. A small, round plastic sink without a drainer is fitted and it has only a cold tap (hot water can be added as an option). The container is in the kitchen cupboard along with the gas supply. A small cutlery drawer is fitted along with two shelves, also in the same cupboard. An LED strip light would be ideally placed here but light is via a spotlamp over the entrance door so you could end up blocking your own light. There is no fridge fitted in the Cockpit; instead, you’ll have to make do with a cool box, which runs off mains or the 12V system. Although the Going Cockpit S doesn’t have a washroom, it does have a loo. It’s not a cassette, but a unit you would use for tent camping, with a detachable holding tank. When not in use, it’s stored in its own cupboard beneath the wardrobe. The Cockpit can be fitted with an optional rear awning, which would be the most likely place to house the toilet while on site. The dinette converts easily into sleeping quarters for two. You could turn the settees into single beds, but we reckon that most users will drop the table between the seat benches and use the square ply filler to convert it into a double. Making up the double can be done in a matter of minutes, with the cushions slotting in easily. The cushions aren’t sprung but foam, which is bordering on the hard side. You wouldn’t buy the Cockpit if you require a massive amount of storage but there is more of it than you may at first think. For instance, beneath the front seat lockers there is excellent storage and once the bedding has been put away, there would be enough room to still put other items in. The storage in the kitchen is limited, with a small shelf above, plus one part of the cupboard is taken with the water container and gas cylinder. It would be better if the water container was connected outside as normal, freeing up some storage. In the right offside corner, a small wardrobe will prevent you from packing too many clothes. 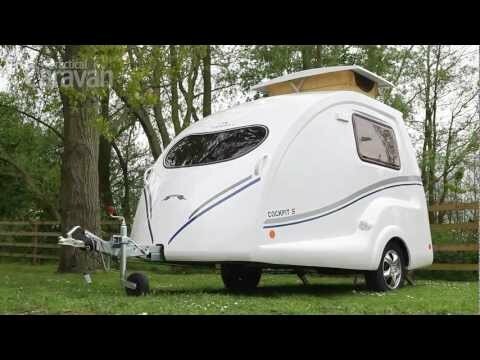 If you’re a lone caravanner and want to keep the cost of your holidays low, the Cockpit could be just the tourer for you. It’s so easy to handle and store. For an organised couple wanting to tour on a shoestring, this teardrop-shaped pop-top will fulfil most requirements. Surprisingly roomy inside, the Going is aimed at a niche market – but it’s one in which this micro-model could become quite successful as more people find out about it.